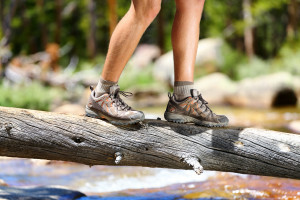 A 2013 study published in the British Medical Journal, by Dr. James Katz, determined that those who incorporate balance exercises into their daily routine reduced their risk of injury from a fall by 37 percent and had a 61 percent lower risk of incurring a broken bone – as compared to those who didn’t practice developing better balance. Don’t be fooled into thinking that loss of balance is limited to seniors. As we age, flexibility and inner ear function age with us. It’s never too soon to take measures to enhance your balance. Consider incorporating these 3 simple exercises into your daily routine. 1. Stand on one foot. Hold the back of a chair and stand on one foot for a count of 10 seconds. Repeat on the opposite foot and do four more sets. You can do this while standing in line at the grocery store or while holding onto a shopping cart. Eventually, you won’t need a cart to keep your balance. Simply lift one foot an inch off the floor, and touch it to the opposite ankle. 2. Put your socks on, standing up. Yes, this will require you to balance on one foot, then the other. As a beginner, lean against the bed, so if you lose your balance, you will land on something soft. Taking your time will help you stay upright. This will also strengthen your leg and core muscles. 3. Lift like a crane. Put an item, such as a coin, pen, or tennis ball, on the seat of a chair. Balance on one foot, lean forward with a straight back, and pick up the item. Stand straight, transfer the object to your other hand, and put it back on the chair seat using the same crane posture that you used to retrieve it. As you develop this skill, place the object at lower heights until you can pick it up of the floor, 10 times on either foot. This exercise also strengthens the back, hips, and legs.